We make hundreds of decisions every day. Most are small, e.g. what should I have for dinner or should I allow the kids to play with a neighbor child? It is the bigger decisions that deserve conscious thought and planning, e.g. what car should I buy, which college should I attend or is it time to change jobs? These bigger decisions need a framework to guide us toward an answer. Decision making is choosing among various options. Good decision making processes guide us toward our personal goals and project objectives. I understand how I make decisions in various situations; I make them deliberately. I can list the pros and cons of my decision options and use this analysis to choose what’s best. I can make important decisions based on principles or criteria. Bigger, more complex problems require a decision making process. Many decisions are made based on our personal or work values. Diversity of thought and experience adds perspective. Seek counsel when making your biggest decisions. Include God in key decisions we make. Silently reflect to discern God’s plan for our lives. Consider how key decisions align with your life purpose. Keep a list of decisions you make in a single day. How many are “big” decisions? Pick one to learn from. 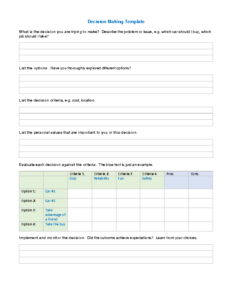 Use the Decision Making Template (below) to list options and criteria in your decision process. Involve others in your decision to get additional perspective. Decision making comes in my “styles and forms”, for example autocratic vs. team-based, compromise vs. consensus, logical vs. emotional principle-based or pros/cons analysis. Values. Values are what we believe to be important in in life and work. We are guided, sometimes unconsciously, by what we hold dear. Examples of values are independence, creativity and flexibility. Take a look at this longer list of values and identify the values that guide your life. Team Decision Making. Some decisions are ours to make by ourselves, e.g. which clothes should I buy. Other decisions involve our employees, team members, families or friends, e.g. what is the start date for an important project or where should we go on vacation. Teams, with multiple points of view, add diversity and usually quality to the thought process and build ownership but may take longer. Know the difference between compromise and consensus. A decision making process is important for more complex decisions. Clarify the decision to be made by describing the problem or issue. List the alternatives (option development is as important as option analysis). List the decision criteria or principles. Evaluate each decision against the criteria. Principle-based decision making. Many decisions involve two or more people, e.g. a family might work together to decide if they should move to another city or a work team might recommend a plan to launch a new product. Our individual decisions are guided by our values. But since each individual has their own unique set of values, common ground must be found in reaching a group consensus. Defining common “principles” is a way to guide decision making in a group. Click here to explore. Consider using the Decision Making Template (below) as a practice exercise. What big decisions do you have to make to support your goals? How am I going to make these decisions? Principles. A fundamental truth or proposition that serves as the foundation for a system of belief or behavior or for a chain of reasoning. Compromise. An agreement or a settlement of a dispute that is reached by each side making concessions. A God-Honoring Decision Making Process by Chris Patton on ChristianFaithatWork.com. An Approach to Good Choices on IgnatianSprirituality.com. Guide to Decision Making by Sheryle Gordon Beatty on TWU.com . A 2 page PDF. Tips to Improve the Decision Making Process by commLab India on YouTube.com discusses decision making in a business context. Personal – Decision-Making (with instructor notes).